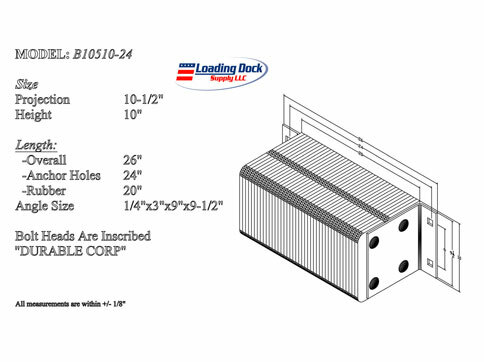 10.5" thick x�10"�high�x 24"�wide.� Laminated Durable Dock Bumper. All bumpers must be 10.5" thick (projection from dock), and closed with two 3" x 3" x 1/4" structural angles under approximately 1,500 lbs of pressure. The angles are welded to 3/4" rods at one end and closed with threaded rod and nut at the other end.